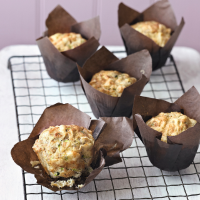 An ideal addition to any lunchbox, these savoury mufns have a lovely light texture and are perfect for a mid-morning or afternoon snack. They’re also delicious served with soup. Heat the oven to 200°C, gas mark 6. In a large bowl, mix together the flour, bicarbonate of soda, porridge, rosemary, courgettes, pepper and three- quarters of the cheese. Make a well in the centre. In a separate bowl, beat together the eggs, yogurt and olive oil. Pour into the courgette mixture and gently stir together but don’t over-mix. Don’t worry if the mixture seems a little dry, because the courgettes will release liquid as they cook. Spoon into 12 muffin cases and scatter over the reserved cheese. Bake for 18-20 minutes, until risen, firm and lightly browned. Best eaten on the day of baking. COOK’S TIP: Try adding a large handful of frozen or fresh sweetcorn kernels to the mixture.